May you be blessed this Christmas season with much love and joy! I originally began this when Pam Kellogg asked me to stitch a piece for the special Christmas issue of Crazy Quilt Quarterly. But as I worked on it, I realized that it didn't have quite the graphic impact that a cover piece should have and so I set it aside and completed the Christmas Tree piece that she ended up using. Since then, I've worked on this, but still don't have it quite finished. I wanted to share it anyway! 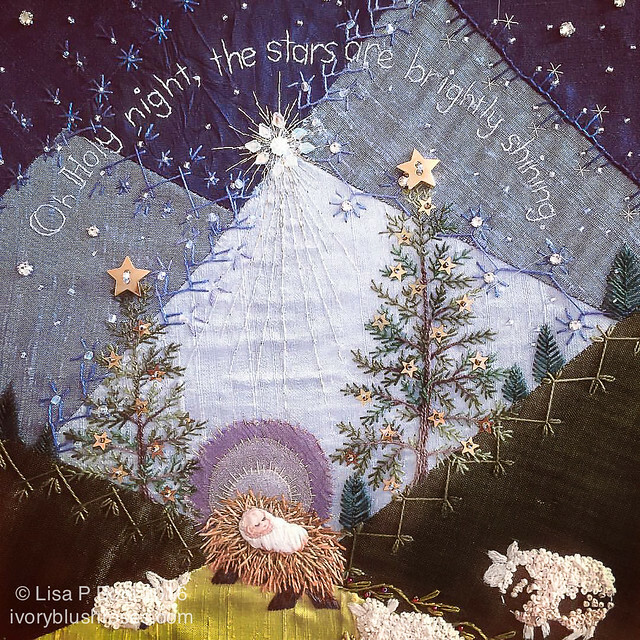 I love your 'Oh Holy Night' piece. It is just so sweet. Merry Christmas and blessings to you. Oh Holy Night indeed! Blessings on you and yours this Christmas. I LOVE this piece Lisa. It is just beautiful and so meaningful! So sweet, I just can't quit looking at it. Love the sweet embroidery. Love the Christmas song - brings back fond memories. Merry and joy to you too. Love your O Holy Night piece. Merry Christmas blessings in abundance to you and yours!! Lisa, I love your work in general and this piece especially, so I am curious about what you feel it needs. In the past, you have "broken down" a block to explain balancing the colors or stitches. I don't think that it needs anything, so would you mind explaining it to me? Maybe you could sketch out (verbally) what you intend to do to finish it? Thank you and Merry Christmas!